I had the chance to see a photo of "Green Ace" and I can say that is almost impossible to relate the Hiroshima Green Funnel ship to the "Marina"... and, although very similar as built to her fleet mates "Green Arrow" and "Green Arch", today the "Marina" is far better of "Express Aris" and "Ierapetra L." respectively! Under her days operating for the "green ferries" was linking Hiroshima to Osaka; then was sold to Kansai Kisen when, in 1982, Hiroshima Green Ferry ran out of business: transferred to the subsidiary Diamond Ferry and renamed as "Okudogo 6", was linking Kobe (Honshu) with Matsuyama (Shikoku) and Oita (Kyushu). As a G.A. Ferries ship, she performed the Dodecanese line for all her career, opponed to Dane Sea Line ferries and matched alternatively by "Dimitra", "Rodanthi", "Daliana" or "Dimitroula". Probably one of the best ferries to Rhodes, in 2002 season she has find the competition of Blue Star Ferries, which put their 2000-built "Blue Star 1" on the same services of "Marina", leaving Piraeus at 20.00 three times a-week (three/four hours after G.A. Ferries) and arriving in Rhodes the day after at 07.20 (same time of the G.A. Ferries faster departures). Gerasimos Agoudimos has attacked the ministry for the decision to give a licence to Blue Star, but Attica Enterprises has introduced a real competition on Rhodes line. I think that it would be a great idea for Mr Agoudimos to have a look at Japanese ferries for sale: it would be a great idea to convert a ten year old Japanese ferry (almost all have a speed of 24/25/27 knots) that would be competitive with Blue Star rather than shouting with the Minister; unfortunately his answer to Blue Star is the "Anthi Marina", which is far millions of years from cruise-ferry concept… So let's hope that the cancellation of the law which forces the Greek ship-owners to use ferries younger than 35 years-old would be cancelled soon enough to save this fantastic ferry from the scrap. The 2006 was started as the first ferry entering Piraeus port, even if I fear that it's one of her last entrances. Sailing with G.A. 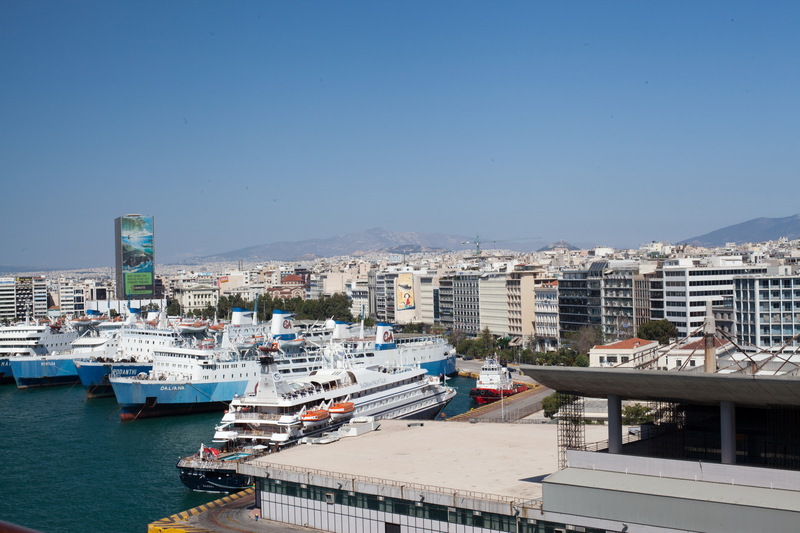 Ferries since 1993, has served almost all routes performed by Gerasimos Agoudimos's company, having visited all the Greek ports. Launched in 1974, she was the 8th and the last ferry of "Free Enterprise" series; even if she resembles very much the appearance of the former IV, V, VI and VII vessels and was also built in the same country, Holland, is not a sister of the former four ferries, being built in a different yard and having different measurements. Another funny thing to notice is that, as long as the best part of ferries have one, two or four main engines, this ferry has three main engines, a very uncommon feature! Under her years of service for the Anglo-Norwegian company Townsend Thoresen and P&O was departing from Dover to Zeebrugge and Boulogne. Bought with the target of substituting the old "Romilda" (nowadays known as "Agios Georgios" of Ventouris) on Dodecanese line, was unexpectedly flagged out from Greek Shipping Registry, it seems because of the not permitted change of operating licence from the original "Romilda" to the new "Romilda". As long as G.A. Ferries could not employ this ferry in any of domestic services, they decided to put her on the new line Ancona – Corfu – Igoumenitsa – Patras together with the flagship "Rodanthi"; however the challenge with the other ferry operators on Ancona route and the timetable of Romilda, which sailed together with the splendid Strintzis Lines's flagship "Ionian Island" led to the failure of Adriatic services so, after a new procedure to enter the Greek Shipping Registry, the ship was finally deployed in the Aegean. She started serving the Dodecanese, but was moved also on services to Ikaria and Samos, then again to Rhodes, passing via Milos, Sitia (Crete), Kassos, Karpathos and Chalki (but also via Syros – Paros – Naxos – Ios – Santorini – Heraklion). The "Romilda" has also experienced two new ferry routes: one leaving Rhodes and arriving in Alexandropolis, passing by almost all the islands along Turkish coast, and the other leaving Nafplion, on Peloponnese Eastern Coast, to Aegean islands. On winter 2000/01 has substituted the "JetFerry 1" from Patras to Cephalonia and Ithaki, being deployed on summer 2003 to Western and Central Cyclades. On summer 2004 is again on her previous year's services, but on week-end she also comes down to the southern Ionian islands of Kithira and Antikithira, which are linked also to Gythion, a small town 50 km south of Sparti, in the Peloponnese district of Lakonia. Wiewing the actual situation of Greek ferry scene, also the "Romilda" has cut her services, sailing only twice a week to "Paronaxia", once to Amorgos and the nearby smaller islands, and once also to Rhodes calling at Amorgos, Astypalea, Nissiros, Tilos and Symi, on a extremely slow timetable, avoiding to "Rodanthi" the weekly call at the smaller islands on the way to Rhodes. She is not a really loved ferry, but is one of G.A. Ferries's main ships.